If you like places with history and unique atmosphere you will love our cosy, small hostel in the heart of Budapest, close to the romantic Danube bank, surrounded by history, classicist buildings and monuments to see. Our goal is to feel yourself comfortable and safe in our hostel and make your stay in Budapest pleasant informing you upon arrival all the important spots on a free Budapest map. No hidden charges. We provide free use of internet and WIFI, free use of linen, free unlimited self-serving coffee and/or tea, cooking facilities, washing facilities, free maps. Check in time is from 08-24. (In case of earlier or later arrivals, check-in is possible if we are previously informed by phone or email). But no curfew, no lockout - every guest get the keys. Attention: Please, be specific with your arrival time or your bed or room could be sold. Check-ins are made upon appointment. That's why you have to inform your arrival time accurately. You can inform us by phone or email until the day of your arrival about any change of your arrival time. Common area is closed at 23:00 to ensure that guests who want to sleep can do so. When you make the booking, write us an email address that you check often or a phone number with the country code and area code . In this way, we can keep in touch with you just in case. Cancellation policy: Guests can cancel their reservation free of charge up to 2 days before arrival. Deposits paid are non refundable. -Taxes are not included. This cost is 2 euro per person per night. -Due to security reasons, we do not accept bookings made by local citizens anymore. Bookings are accepted from foreigner citizens only. If a local citizen make a booking, it will be not accepted and the deposit will be not refunded. 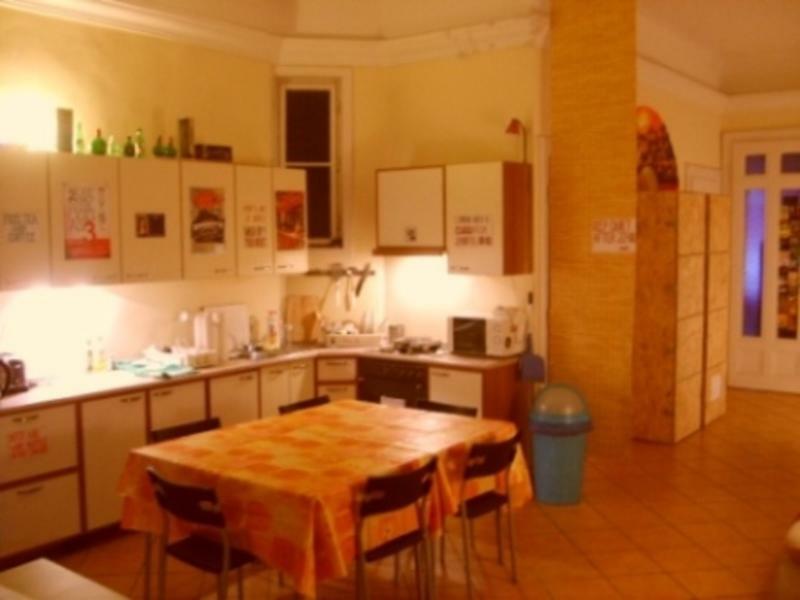 -Since this is a youth hostel, we do not accept bookings made by people over 45 years old. - From Ferenciek tere turn 90 degrees left at the top of the escalator, go up the stairs to the ground level, turn 180 degrees and walk away from the bridge on the right side of the Avenue. Walk up the Avenue to reach Szep street (the first right). We are house number 5. Push the bell. or just ask for a taxi at front of the Airport. It costs around 5500 HUF. - Go underground and catch the red metro line to Astoria. Take the escalator upstairs and walk to the far left exit marked Kossuth Lajos ut. - Walk straight ahead 100 meters to reach Szep utca (the second left). We are house number 5. Push the bell. - Go underground and catch the blue metro line to Ferenciek tere. - From Ferenciek tere turn 90 degrees left at the top of the escalator, go up the stairs to the ground level, turn 180 degrees and walk away from the bridge on the right side of the Avenue. Walk up the Avenue to reach Szep street (the first right). We are house number 5. Push the bell. -Go till the Erzsebet bridge ( White bridge) and go towards Pest side (East to West) up the Boulevar till the 3rd street (Magyar utca). Turn right, go up the street and turn right again on the first corner. Go up the street and reach Szep utca ( the first right).